State Route (SR) 237 in Santa Clara County connects I-880 and I-680 with US 101 and SR 85, providing an east and west connection between the East Bay Area and the Peninsula. SR 237 connects commuters to technology and professional service industries in Santa Clara. 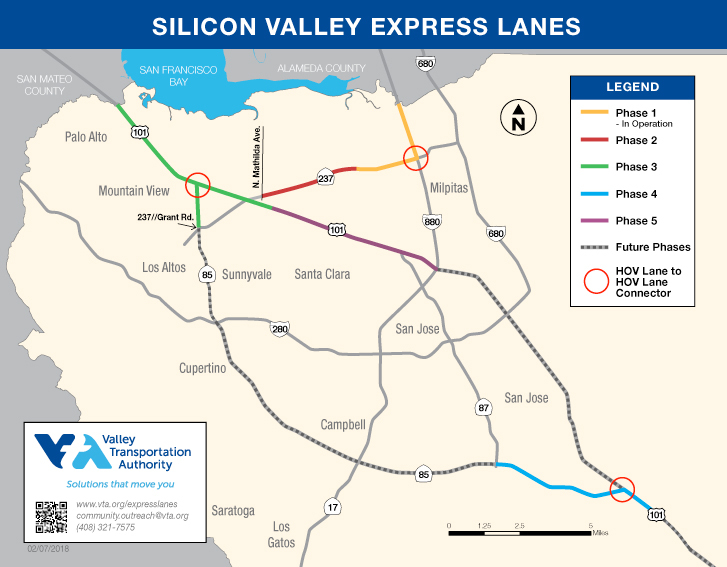 In March of 2012, VTA began operation of Santa Clara County’s first express lanes on the SR 237/I-880 corridor. The express lanes along the SR 237 and I-880 corridor in Santa Clara County begin just south of Dixon Landing Road on I-880 and North First Street on SR 237. The first phase is what we have in operation today: The express lanes and interchange ramps from Dixon Landing Road to N. 1st Street. Phase 2 will extend the 237 express lanes from N. 1st Street to Mathilda Avenue in Sunnyvale, in both directions. Interested in learning more about using VTA's Express Lanes on State Route 237? Visit our Using Express Lanes, How FasTrak Works and Using Express Lanes FAQ pages. Find the latest construction updates, including lane closures, on our construction updates page.